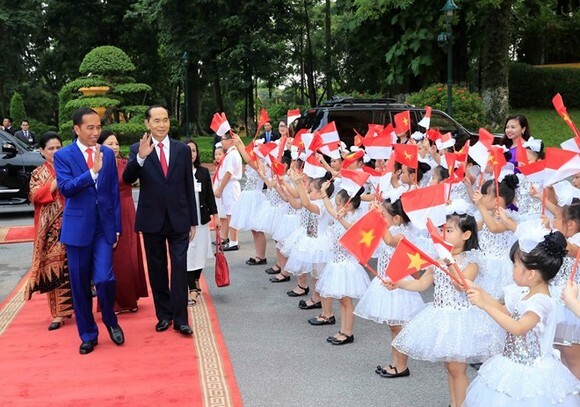 President Tran Dai Quang and his guest, visiting Indonesian President Joko Widodo, had a meeting with representatives of Vietnamese and foreign media in Hanoi on September 11 to inform them of the outcomes of the talks between the two leaders held earlier the same day. President Quang said the two leaders had very successful talks, during which they exchanged ideas on all aspects of the relations between the two countries, discussed and agreed to further develop the Vietnam – Indonesia strategic partnership in a more vigorous and profound way, for the interest of each country and for the sake of peace, prosperity, cooperation and development prevailing in the region. The State leader stressed that the two sides worked out major orientations to push up bilateral in the time to come, focusing on the boosting of delegation exchanges and contacts at all levels via the channels of State, National Assembly and Government, as well as people-to-people exchanges so as to further improve the bonds and political trust and, at the same time, lay a foundation conducive to the bringing into full play the potential and advantages, thus bringing about practical, effective and mutually beneficial fruits to the bilateral cooperation. The two leaders also pledged mutual support in grasping chances of the regional economic linkage to strengthen the bilateral trade cooperation and within the ASEAN. President Quang stressed that the two sides agreed to facilitate each other’s key exports, striving to bring the revenue of the bilateral trade of goods to the level of US$10 billion or even higher in 2020. President Widodo said very many Indonesian investors look to develop their investment in Vietnam, and that is why Indonesia hopes the Vietnamese State will facilitate and give fair treatment to Indonesian investors. Sharing the common values on a region of peace, stability, security and safety, President Quang said the two sides pledged to continue pushing up their defence – security cooperation to effectively cope with traditional and non-traditional security challenges now rising in the region. The two sides will also intensify their cooperation on the sea, agriculture, transport, energy, culture, tourism, people-to-people exchanges, etc, to match the potential and demand of the two countries. President Widodo said the two sides agreed to strengthen cooperation in fighting and preventing illegal fishing activities, and accelerate negotiations on the two countries’ exclusive economic zones. The two leaders laid stress on the strengthening of cooperation to complete the goal of building the ASEAN Community Vision 2025, building an ASEAN Community of solidarity, self-reliance and creativeness, and bringing into full play its central role in the region as well as contributing to the maintenance of peace, stability and development in the Indo-Asia-Pacific region. They also agreed to support trade liberalization, ensuring peace, security and development of the states in the region. President Quang said the two sides reaffirmed the importance of peace, stability, security, marine and aviation safety and freedom in the East Sea; settling disputes by peaceful measures on the basis of international law, especially the UN Convention on the Law of the Sea (UNCLOS) 1982, fully respecting the diplomatic and legal procedures, seriously and fully implementing the Declaration on the Conduct of the Parties in the East Sea (DOC) and reaching the Code of Conduct (COC) at an early date. President Widodo stressed Indonesia welcomes progress recorded in the negotiations on COC, making important contributions to affirming that the Ease Sea remains a region of safety, stability and peace. He also thanked Vietnam for supporting Indonesia’s viewpoint on the perception of the Indo-Pacific. President Joko Widodo is now making a state-level visit to Vietnam from September 11-12 at the invitation of President Tran Dai Quang. After their talks which followed the official welcome ceremony for the guest also on September 11, the two leaders witnessed the signing of various cooperation documents between the two countries.